For a copy of the June 2018 Board Meeting Minutes, please click here. The next Board Meeting has been rescheduled for Monday, August 6th. Due to some last minute board member cancellations, the confirmed attendees have dropped below quorum for the meeting so it will be cancelled. The next Board Meeting will be August 7th. For a copy of the May 2018 General Meeting Minutes, please click here. For a copy of the April 2018 Board Meeting Minutes, please click here. For a copy of the March 2018 General Meeting Minutes, please click here. For a copy of the March 2018 Board Meeting Minutes, please click here. For a copy of the February 2018 Board Meeting Minutes, please click here. Before we begin the design of 100 Labor we would like to share with the community a review of the process of development to date of Victoria Commons. Our plan is to walk the community through the historic progression of decisions made on Victoria Commons with particular emphasis on decisions relevant to the development of the 100 Labor apartments. We will share thoughts about the site and will take questions relevant to our project and it’s development. Note that check #151 was mistakenly written to David Lopez, Bonham Robotics in the amount of $1496.49. This should have come from the Friends of Bonham account. Treasurer, Cherise Rohr-Allegrini mixed up the check books. Two checks (#139 – $1469.49 and #141 $27) have been deposited into the LNA account to reimburse this error. The 2018 treasurer will be Vik Gudi, who will be added to the Frost Account. Cherise Rohr-Allegrini will the 2018 President and will remain on the Frost Account. Selsa Gonzalez will be President Emeritus and will be removed from the Frost Account. 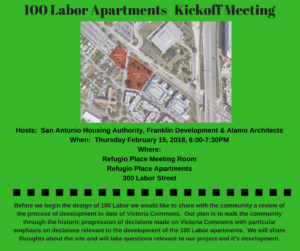 January 10th General Meeting at St Joseph’s Hall 420 E Cesar E Chavez Blvd 6-8:30pm. Jen Morey, King William resident and STR I owner representative to the STR Task Force provided an overview of the proposed STR ordinance. Board will review ordinance and make suggestions. Selsa will contact John Stevens to discuss vacant properties ordinance. Joan Carabin provided an update on the fundraising meeting hosted at her house on Monday, Dec 11. Our overall goal is to raise $30,000 which will cover the cost of lighting at Labor St Park. Seeking sponsorship has been discussed. Vik and Cherise will work on sponsor letters. Selsa will determine if we can put up signs with sponsors’ names. Also discussed was a possible bingo/loteria night. Other potential fundraisers are medal sales, t-shirts, and bumper stickers.